The road has been a bumpy one, but the project formerly referred to as "Min Topology" is finally out of Preview and available for download in General Availability (GA). Everyone, can we please give a warm welcome to the latest member of the Skype for Business Hybrid family, Skype for Business Cloud Connector Edition! Before I discuss too much about Cloud Connector Edition (CCE), let me provide a few helpful links. I must point out this post is NOT a deep-dive into CCE; rather it is a discussion about what CCE is, and how your organization can take advantage of it. The below links will provide deep-dive information from Microsoft for all the specific requirements and deployment steps. First, before you go racing to download it, check out the TechNet article on how to plan for it: https://technet.microsoft.com/en-us/library/mt605227.aspx. Alright, finally, the link to download CCE: https://www.microsoft.com/en-us/download/details.aspx?id=51693. Excellent! Now, if you are still reading this, and haven't raced off to start tinkering with CCE, let's talk a bit about the nature of this product. 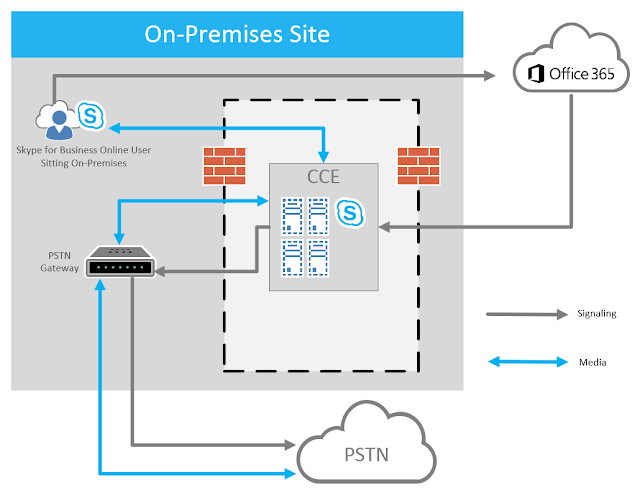 At the heart of this tool is a very specific deployment: CCE addresses a scenario in which all Skype for Business users in your organization are using Skype for Business Online in Office 365, but you have an on-premises voice infrastructure already in place that provides PSTN connectivity. This means that your organization DOES have the on-premises voice infrastructure, but DOES NOT have any Skype for Business infrastructure deployed on-premises; all Skype for Business users are Office 365-based users. Savvy? Now, of course your users in Skype for Business Online could simply use PSTN services offered by Microsoft through Office 365, assuming they are licensed for Cloud PBX already, but you will also have to pay for the extra voice licensing (in addition to Cloud PBX licensing). If your organization has already invested in the on-premises voice configuration, and still has a contractual obligation to use this infrastructure, it is likely that the most desired approach would be to leverage this on-premises voice infrastructure to provide PSTN connectivity to your Skype for Business Online users. How, you ask, when there is no on-premises Skype for Business deployment to facilitate the needed hybrid configuration that could provide such functionality? This is where Cloud Connector Edition comes in! Before you become concerned about the Domain Controller component, let me make it clear that this little virtual environment is completely self-contained, including the Domain Controller (DC). That means this DC is deployed in its own brand new forest, and will not be connected to your corporate Active Directory. The other pieces are fairly obvious, as they put into the place the bare minimum requirements for a functioning Skype for Business deployment that can facilitate the traversal of the media from your Cloud PBX to your on-premises voice infrastructure (thus the previous term, "Min Topology"). What would a more detailed media flow look like? The below image shows us that our signaling traffic does have to traverse through Office 365 before coming back through our CCE deployment, and then making its way through the gateway and out into the wild PSTN. It seems like this would be less than optimal for audio, though, doesn't it? Luckily, as we can see in the same diagram below, once the signaling traffic verifies the information for the user, that user's media is able to flow directly to the CCE host (completely skipping the Office 365 infrastructure), and on to the on-premises PSTN gateway. Beautiful! So, would do you think? 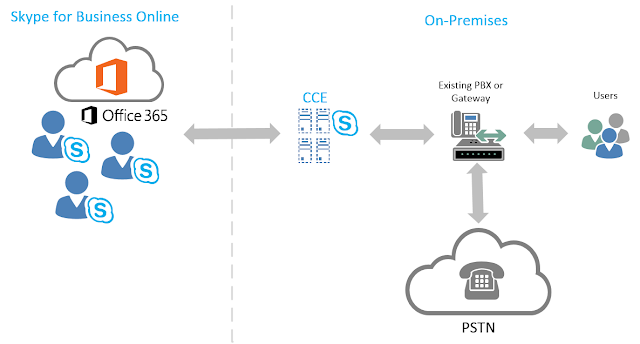 Is this a pretty cool solution for providing existing on-premises PSTN connectivity to your Skype for Business Online users without having to have a full-blown, licensed, on-premises Skype for Business Server 2015 deployment? I think so! Like I said, I am not going to go deep on this post in regards to requirements, planning, and detailed deployment; that is all highlighted quite nicely in the Microsoft links provided above. Instead, I hope this post has been helpful in familiarizing you with what Cloud Connector Edition is, how your Office 365-based Skype for Business users can benefit from it, and whether or not this is something your organization needs to explore a bit more deeply. For the consultant crowd, this is certainly a deployment option to gain knowledge on to be ready to pitch it to the customer that is the right fit! Does CCE work even if the on-prem PBX is Cisco gear?